Balfe was born in Dublin in 1808, therefore a bicentenary looms. As Heyward John St Leger says in his Reminiscences of Balfe - written in 1870 and not a trustworthy biography but nevertheless �interspersed with many interesting and humorous anecdotes� - �at 21 years of age he was a linguist, a good violinist, a charming vocalist, a clever pianist, a young composer, and a generally well-informed man. He had an ardent temperament, quick to receive impressions, and enthusiastic in all he undertook�. On the death of his father, Balfe came to in London for two years (1823-25), studied composition with Charles Horn (organist at St George�s Chapel, Windsor), and played violin in the orchestra at Drury Lane, after which he went to Paris where he met Cherubini and Rossini. On the latter�s advice he went to Milan where he studied singing with Filippo Galli and composition with Ferdinando Paer in Rome. He returned to Paris in 1827 and the following year sang Figaro in Rossini�s Barber of Seville under the composer�s direction at the Italian Theatre. In 1829 he returned to Italy, where at Palermo he took a part in Bellini�s La straniera in January 1830. In 1831 he met and married a Hungarian soprano called Lina Roser and together they sang in operas by Bellini and Rossini. In 1834 he made his debut at La Scala, Milan singing with the famous diva Maria Malibran in Rossini�s Otello and went on to sing with her in Barber of Seville and Bellini�s La Sonnambula. Malibran called Balfe Il Rossini Inglese, and recommended him to the impresario and playwright Alfred Bunn in London, whence he returned in 1835. In Italy he had already written three operas - for the cities of Palermo, Pavia and Milan - but his first opera for London opened on 28 October 1835 and was called The Siege of Rochelle. It was performed at Drury Lane, where his statue, sculpted in 1874 by Leo Malempré, stands in the inner lobby to this day. The opera was so successful that Bunn commissioned Balfe to write an opera for Malibran, loosely based on Abbé Prévost�s Manon Lescaut, The Maid of Artois was another huge success. In 1846 Balfe succeeded Costa at Her Majesty�s Theatre in London until 1852, in which year he visited Petrograd. Of his 25 operas (in English, Italian and French) written at a consistent pace of one a year from 1835-1860, it is The Bohemian Girl (1843), probably the most popular opera in the second half of nineteenth century England, with which his name endures to this day. It was soon performed in theatres from New York (1844) to Sydney (1846), Dublin (1844) to Cape Town (1887), and Prague (1847) to Toronto (1874). Among other Balfe operas are Catherine Grey (Drury Lane, 1837), Joan of Arc (1837), Diadeste or The Veiled Lady (1838), Falstaff (1838), Keolanthe or The Unearthly Bride (1841), The Daughter of St Mark (1844), The Enchantress (1845), The Bondman (1846), The Devil�s In It (1847), The Maid of Honour (1847, The Sicilian Bride (1852), The Rose of Castile (1857), Satanella or The Power of Love (1858), and Bianca or The Bravo�s Bride (1860). His operas were taken up by touring companies run by the likes of Carl Rosa and Moody Manners, assuaging a Victorian thirst for opera which combined ballad and dialogue, a formula eventually superseded by the musical. Judging by the colourful portrait which adorns this CD set, Maria Malibran was a dazzling beauty, all the more tragic that she died in November 1836, a matter of weeks after her last performance of the run of The Maid of Artois (16 July 1836). She was only 28 years old, and her death may well have been caused by a fall from her horse during pregnancy. "When Balfe was composing his opera The Maid of Artois Madame Malibran de Bériot did not like the finale, so she requested him to write another, when he composed the world-renowned aria �With Rapture Dwelling�. On Balfe taking the manuscript to Madame Malibran she was in bed indisposed, and wishing to hear the new finale, we had a cottage piano carried upstairs to her room; and Madame Malibran�s joy was unbounded at the brilliant and beautiful aria, which, on the first night of performance, was honoured with a double encore, and was so popular among the Russian Imperial family that Balfe was called by them Monsieur Balfe de l�air. "By the way, talking of this air, Balfe told me one night he was at the Imperial Palace at St Petersburg, in the time of the late Emperor Nicholas, and on his leaving, as he was descending the staircase, he heard someone whistling �With rapture dwelling� [Leger meant �The rapture swelling�]. To his surprise he found it was the Grand Duchess Constantine. On perceiving Balfe, her Imperial Highness and one of her sisters laughed when Balfe said �I know your Imperial Highness has many accomplishments, but I was not aware whistling was one, and I feel highly honoured at hearing my aria whistled so exquisitely." The opera is set in the gardens of the Palais Royal in 18th century Paris at the end of the reign of Louis XV, followed by scenes in an apartment and salon in the Marquis� mansion (Act One). Other scenes include the courtyard of a fortress, with prison cells and a redoubt lined with cannon, at Sinamari (French Guyana) overlooking the sea (Act Two), and finally in a sandy desert near Cayenne (Act Three). The story revolves around the love between Jules and his sweetheart Isoline who has been lost to the Marquis de Chateau-Vieux, while Jules is forcibly enlisted into the service of the Marquis. Jules is sent into exile, having wounded the Marquis in a duel, and it takes years for Isoline (disguised as a sailor) to track him down to the fortress at Sinamari. The final act begins with the young couple dying of thirst in the desert, that is until the distant sounds of a marching band announce rescue and a happy ending. 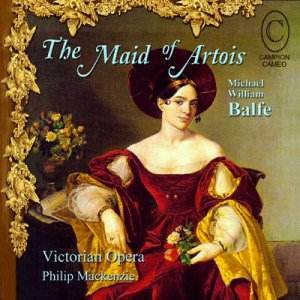 That the music is vastly superior to the libretto is the work�s saving grace, but nevertheless the North-West-based Victorian Opera is to be sincerely congratulated for reviving The Maid of Artois, especially as we know only of performances in London (the initial run begun on 27 May 1836), a benefit performance on 7 June 1838 in which Balfe himself sang the Marquis, the run with Anna Bishop beginning 8 October 1846, further performances in New York and Philadelphia in 1847, and back in England in Hull in 1849. It would be ideal for a Festival such as Wexford, Buxton, Garsington or Grange Park, rather than for the repertoire of a permanent opera house. In the CD booklet one can mine a rich seam of research, such as an introductory essay contributed by Richard Bonynge on the relationship between Malibran and Balfe. There�s also Raymond J Walker�s synopsis and brief but informative essays on the opera, composer and libretto. Musicologist Valerie Langfield describes with expert clarity the preparation of the music and the performing edition used. This restores Balfe�s original intentions, distorted as they were by his experience of the Malibran run, so he excised the changes and interpolations she introduced to show off her vocal prowess in a display of virtuosity. Balfe wrote not only operas but many songs. His music owes much to his contemporaries Rossini, Donizetti and Auber, but in turn there is the noteworthy influence he clearly had on Sullivan - let alone on Verdi whose first successful opera, Nabucco, Balfe conducted in London, and who was entrusted with his I Masnadieri with Jenny Lind in the cast, having conducted the first two performances in 1847. The music of the Maid of Artois is often sentimental, a prime ingredient of the Victorian ballad, but Balfe in his later works replaced it with scena-style writing as taste changed. The Victorian Opera orchestra gets stuck in right away with a spirited rendition of the substantial (ten minutes) overture with its side-drum ending recalling the falling guillotine at the end of the March to the Scaffold in Berlioz�s Symphonie fantastique a decade or so earlier. Soon after the overture begins there appears to be some interesting scoring highlighting a double-bass line independent of the cellos. Because the double-bass achieves a prominence elsewhere in the opera (for example at the start of track 8), it occurred to this reviewer that it may have been microphone positioning favouring the bass at the expense of the two cellos, which are hardly ever heard apart from a brief solo late on in the opera, rather than an imaginative selection of instrumental colour on the composer�s part. Without a score one is dependent solely on what one hears. There are, however, a couple of striking moments of original instrumentation, the horn solo at the start of Jules� cavatina in Act One (track 5), and the splendid combination of harp with trumpet (even better would have been the cornet Balfe wanted) for �The Light of Other Days� sung by the Marquis. It also indicates the calibre of instrumental playing available to the composer at Drury Lane, where he might have had as many as seventy players with him in the pit. On this recording the string strength is modest and consists of six firsts, four seconds, three violas, two cellos and a single bass, while elsewhere two horns and a serpent are dropped from the double winds, horns and trumpets, plus three trombones, timpani, percussion and harp. Conductor Philip Mackenzie has grasped the style of the music and generally settles on appropriate tempi, though some accelerandos seem to take a while to get going as the numbers round the bend and head down the final straight. In her booklet essay Dr Langfield challenges professional opera companies to take up the work, exhorting them to judge its virtues and suitability for themselves, and offering them the inducement of a ready-made set of new performing materials largely based upon the 1846 revised version. The question therefore must be asked whether this recording is good enough to persuade such professional companies to take up the work. Plain speaking requires an emphatic �yes� but with a huge caveat, because where it does fall down is where similar problems would present themselves to professional companies. First it needs a diva of Malibran�s quality, let�s say Joan Sutherland to bring it nearer to our own day. Kay Jordan makes a valiant attempt and largely carries off the fiendishly difficult coloratura and vocal pyrotechnics of the part. Malibran was variously described as anything from a contralto, through mezzo to a soprano. Ms Jordan is emphatically stronger in the middle and higher registers of the part than in the lower, but she has a fine sense of style and produces much agility, especially in the fearsome demands of Act One Scene 3 in which she hardly stops singing: two arias, a duet, a trio and an ensemble finale. Stephen Anthony Brown struggles manfully with some equally fearsome and persistent high register work, but where the vocal line is less flamboyant and the mood calmer, he produces some lovely lyrical sounds reminiscent of the young Pears. And there we get to the heart of the matter. Balfe is not an English composer under the influence of Mendelssohn, to whom he would have succumbed like all other composers of his day if he had stayed in England; instead he went to Italy and came back reeking of Rossini, Bellini and Donizetti - flavoured with a touch of Auber in Paris. And it requires Italianate voices with watertight vocal security to bring off all the bel canto and florid coloratura such music demands. The final lines of the verses in Jonathan Pugsley�s initial aria as the Marquis stretch the top of his voice to produce some uncomfortably flat intonation - and he is by no means alone among the principals to lapse into this failing. Of such slaves together met. Skulking back himself to hide. They�re blushing white as writing paper. Neither can one imagine how many more words ending in �-ounded� Bunn might have used in the Trio finale of Act One, �bounded�, �founded�, �sounded�, �astounded�, �surrounded�, �confounded�, and �grounded� in what is definitely not a comedy. But it is Victorian melodrama which can produce an exchange such as this. Jules: �What wretch are you to lay a hand on one so dear to me? And by what right?�. Marquis: �Those I command, my fittest answer be. Appear! Appear! I summon you here, my servants, friends, and guard at hand�. This is a splendidly produced recording into which a lot of hard work and a labour of love has gone. It seems that it was recorded in just two days (i.e. four sessions), not nearly long enough for such a substantial work, and probably the dangers to a singer�s health which prevail in the month of February - lethal to most vocal chords - will not have helped. Money was probably the reason more time could not be found. Nevertheless it is a grand achievement, one which has awakened us all to the huge importance of the music of Balfe, of which there is still a vast amount to explore, probably - despite the early demise of La Malibran - most of it just as hard to sing. This is not forgotten music, in this 21st century it is unknown music, and Victorian Opera Northwest have put us on the road to rectify matters.